If you've ever let your bunny have unsupervised run of the house, you're aware of the destructive chewing capabilities of one small rabbit. Mother Nature designed bunnies to constantly chew in order to wear down their teeth. Rabbits without proper chewing materials often suffer from dental disease, as well as digestive issues. Your vet will examine your rabbit's teeth carefully during the annual well visit. Adult rabbits have 28 teeth. These include six front teeth, or incisors, consisting of two on the bottom and four on the top. The incisors grip their food and also chew it into pieces. Rabbits also have premolars and molars, or cheek teeth. These teeth do the grinding. The constant action of chewing and grinding ideally keeps your rabbit's teeth at the correct length. 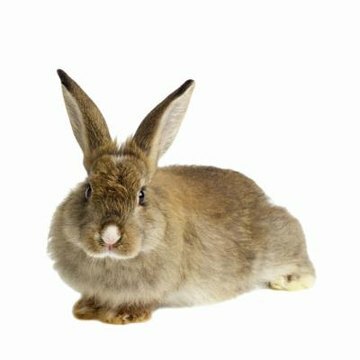 Every month, your rabbit's teeth grow approximately 2 millimeters. If your bunny doesn't have sufficient and proper material to chew on, normal wear of the teeth won't occur, and he'll be at risk. He could end up with tusklike incisors or molars with sharp points; he'll be unable to eat. Your bunny might also occasionally grind his teeth; it's a normal behavior that helps wear them down. If your bunny constantly grinds his teeth, it's a sign of pain; a vet visit is in order. If your bunny's teeth don't wear down correctly, he can develop malocclusion, or tooth misalignment. While you can often see overgrown incisors, it's harder to view overgrown grinding teeth. Signs of malocclusion include drooling, bad mouth odor, lack of appetite, eye bulging due to tooth abscess, excessive tearing and nasal discharge. Your vet might trim your rabbit's teeth or perform extractions. It's possible your rabbit will require regular tooth trimming as frequently as every two months. You can ask your vet to show you how to perform this procedure and provide you with the correct equipment. Keeping your rabbit's teeth and gut in good repair means providing him with a constant supply of grass or timothy hay. The hay fiber helps wear down his teeth and keeps his gut active, preventing digestive ailments such as potentially fatal bouts of colic. In addition to hay, give your bunny harder objects to gnaw on, such as pesticide-free woods or chew toys specifically designed for rabbits. When allowing your rabbit out of the cage, make sure to bunny-proof the room first. If he's not penned in, always supervise your bunny's excursions. Not only does this limit damage to furniture and carpeting, it can prevent your bunny from electrocuting himself by chewing wires.